The final Aftermath image this week comes from the same collection of stereo cards and the caption for it states the photograph was taken at Langemarck, one of the Flemish villages heavily fought over near Ypres during the Great War. On close examination of the image it is clear the tank is a Mark IV Female – armed with machine-guns – and the legend ‘B4’ is painted on it which identifies the tank as being part of the 2nd (‘B’) Battalion Tank Corps. Research online at the Landships website shows that tank B4 was lost in the fighting north of Inverness Copse on 23rd August 1917. Commanded by 2/Lt P.C.Chambers it first broke down, was repaired, and then moved up only to be hit and burnt out – evidence of the battle damage is clear on the photo. Chambers got out and survived Third Ypres only to be killed on the Somme in 1918. This tank formed part of the famous ‘Tank Graveyard‘ close to Clapham Junction, which remained a tourist attraction well into the 1920s and 30s. Here the hulks of tanks knocked out in 1917 littered the ground where they had bogged, been disabled or knocked out. This entry was posted on 06/04/2012 by sommecourt. It was filed under Aftermath, Battlefields, Belgium, Flanders, Great War, Tanks, Western Front, WW1, Ypres and was tagged with Aftermath, Battlefields, Flanders, Langemarck, Tank, WW1, Ypres. 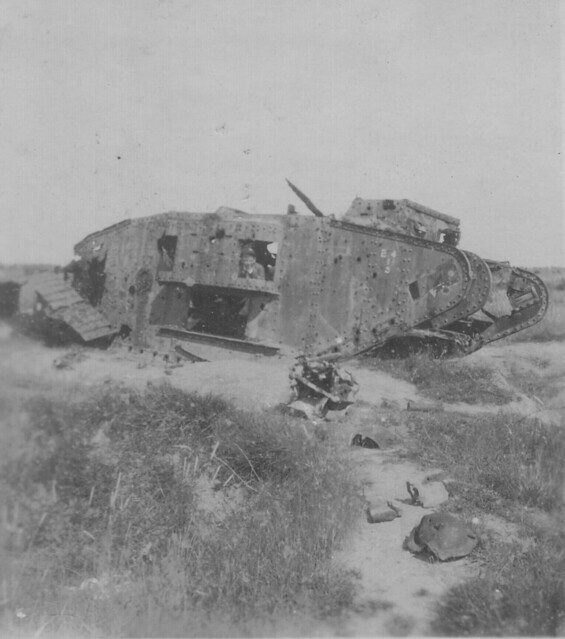 You’re right that this is a B Battalion tank lost on 23 August 1917, but it isn’t Chamber’s tank. It would appear you’ve been misled by the idiosyncratic way that B Battalion marked their tanks at this stage in the war. There are three rows of letters and numbers, the top one shows the Battalion and Company, the second the Section and the bottom row the tank/crew number. Thus this tank was actually B3 of 1 Section, 4 Company, B Battalion. This was “Bluebird” serial 2520 and commanded on that date by 2/Lt A.H. Goodall. Great photo though and the only one I have seen showing the tank from this side. Thanks for that information – most helpful.